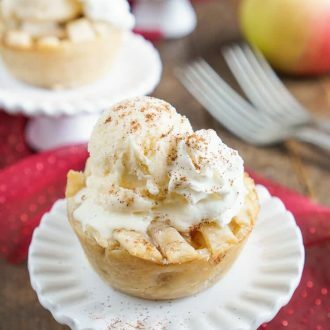 These Mini Apple Pies à la Mode are made with a premade pie crust and a sweet seasonal blend of apples and cinnamon. Have I posted anything with apples yet this year? I don’t think so and I these mini apple pies are long overdue. Especially with the chilly air moving in and the leaves starting to change. In all honesty, I’m not really a huge fan of apples. I like them baked covered in butter, cinnamon, and brown sugar, but otherwise, you’re not likely to see me mowing down on one. There really is something special about cinnamon and apples don’t you think? I’m not sure it’s a fall thing as much as an American one, apple pies are kind of a staple of the summer holidays as well. Either way, you won’t ever find me turning down apple pie, especially when it’s served a la mode, and ESPECIALLY when they’re mini apple pies! 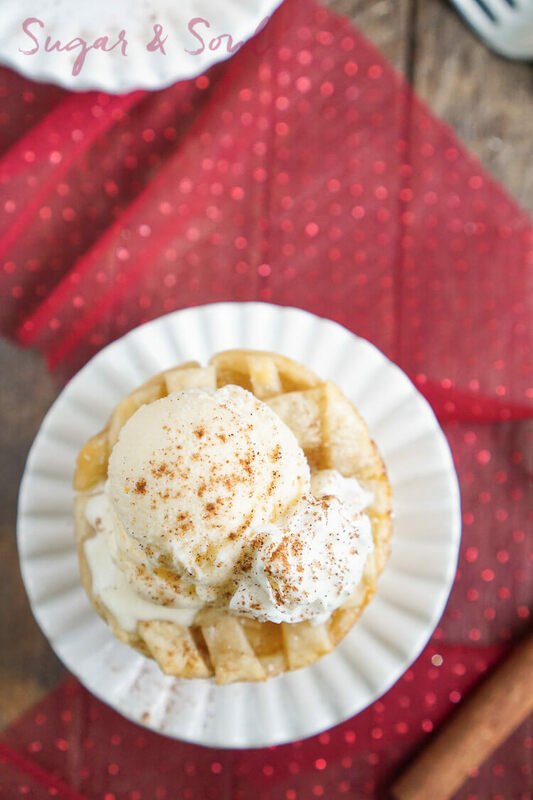 For real though, when that ice cream starts to melt over that flaky, buttery crust and that sweet mix of apple filling… it’s bliss! Plus, you just gotta add whipped cream, you with me? If you need to take a minute to wipe the drool off of your keyboard, I totally understand. I think what I love most about these pies is the fact that they’re mini, and they can be made in batches of just 5! I know a lot of the desserts I make have a pretty high volume, I mean who needs 24 cupcakes, so hopefully, this will help combat all those desserts made to serve an army. The filling recipe is actually my Caramel Apple Pie Dip without the caramel, but you can totally leave it in if you choose. And when you use pre-made pie dough, this dessert is as easy as pie… like what I did there? You will want to use a regular muffin/cupcake pan to make these, NOT a mini cupcake pan. You could use homemade pie crust if desired, but I use pre-made for these. I recommend taking it out of the fridge and letting it sit on the counter for 15 minutes before using, this will help it soften enough to work with and prevent cracking. I like using a pastry wheel or pizza cutter to cut out my strips for the lattice topping, but you could use a cookie cutter to make different shapes like hearts and leaves. Feel free to get creative! What Are the Best Apples to use for Baking? 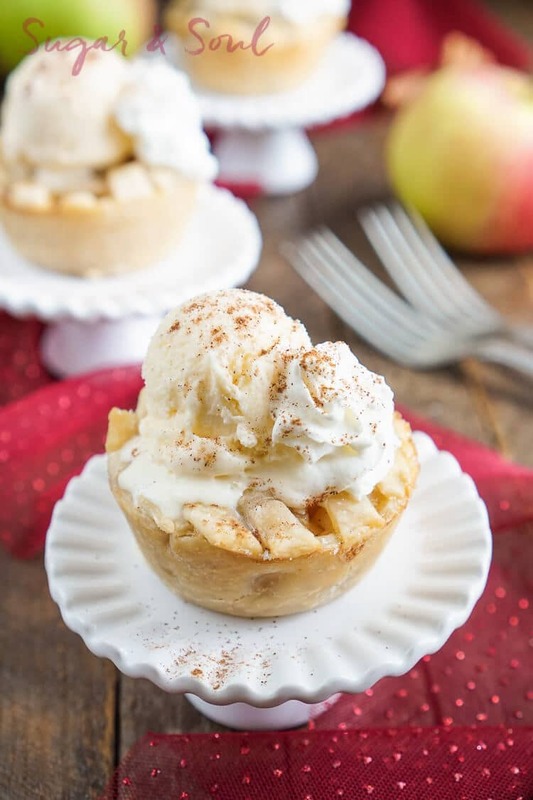 This might be the most important question to ask when making this mini apple pies recipe, honestly, though, it comes down to personal preference, but here are my top recommendations for this recipe! 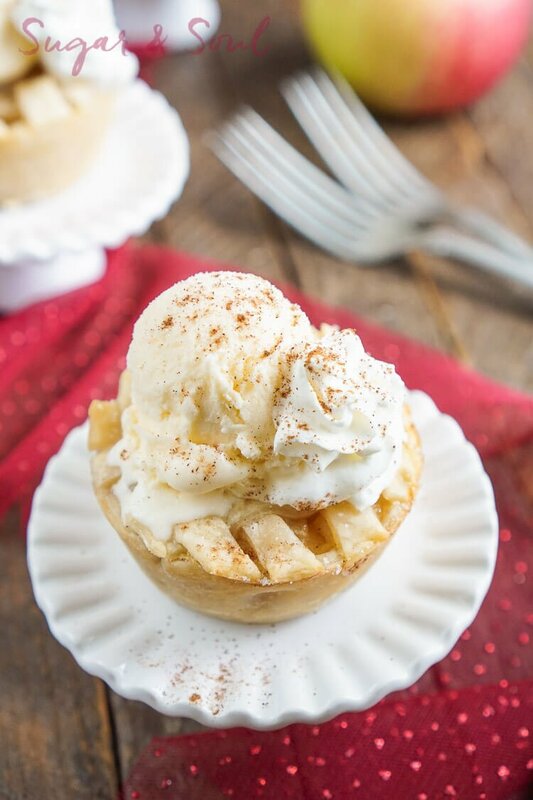 Honeycrisp – This is my personal favorite for baked apple dishes. The bake up great, I can almost always find them, and they add a slight touch of honey to the recipe. Granny Smith – This tends to be the go-to apple for most bakers because it adds a touch of tartness to baked dishes which prevents them from being too sweet, they also hold their shape the best during baking. Cortland – This apple tends to bake up a little softer, but it doesn’t turn to mush. Its flavor profile is a mix of sweet and tart. Braeburn – Another great choice with a mixture of sweet and tart flavor. This is a great one to pair with granny smith apples for a bit of contrast in the recipe. This is a drier apple, so if using this, your filling will be less juicy. Empire – This is a cross between a McIntosh apple and a Red Delicious. It stays firm during baking and has a sweet flavor. Jonathan – This apple isn’t as common across the country, but if you can find them, it’s a great choice. They have a tart and spicy profile that lends well to baking. McIntosh – Not my first choice, but they are very common here in Maine in the fall and super cheap. They can definitely be used for baking, but it’s best to mix them with a sturdier apple like a granny smith or golden delicious because they are really soft and juicy and break down quite a bit when cooked. 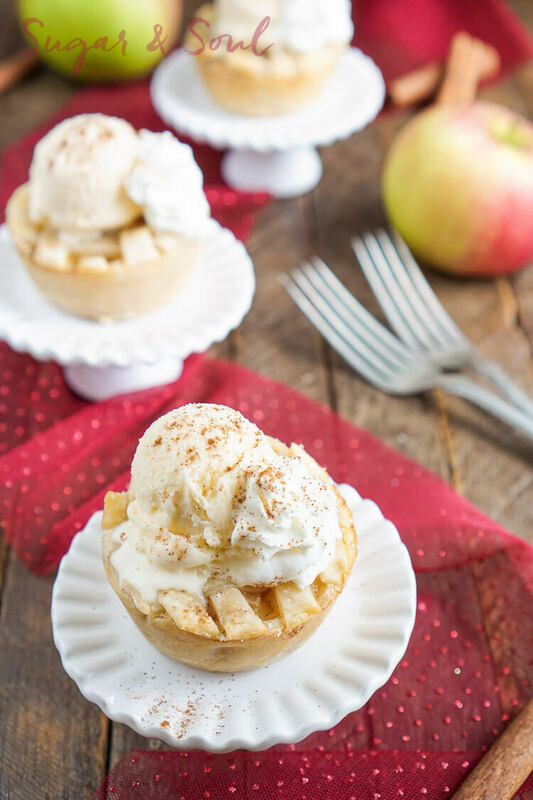 Pin this Mini Apple Pie Recipe for Later! 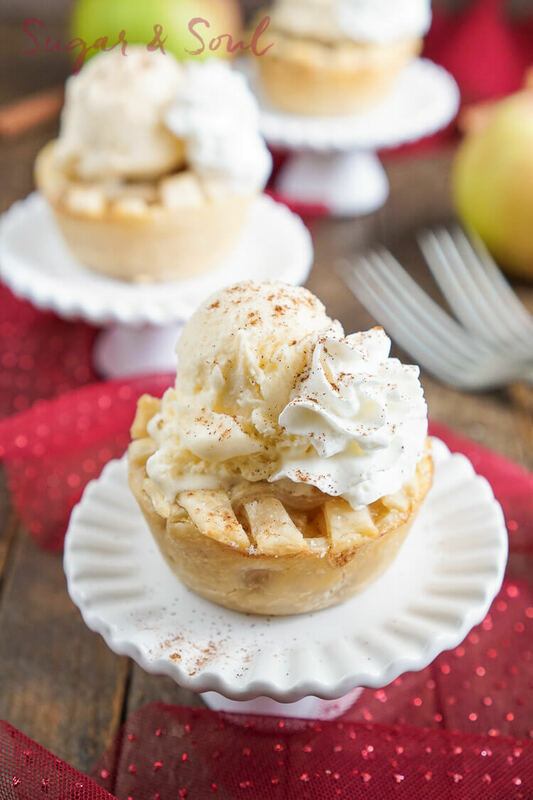 These Mini Apple Pies a la Mode are made with a premade pie crust and a sweet seasonal blend of apples and cinnamon. Combine chopped apples, lemon juice, light brown sugar, and apple pie spice in a medium pot. Cook over low-medium heat until the juice from the apple begins to boil. Dissolve corn starch in water in a separate bowl and stir into apple mixture. Bring to a boil again and allow mix to thicken, remove from heat and set aside. Roll one sheet of pie crust out in a floured cutting board and use a rolling pin to smooth out any creases. Using a 4 inch round cookie cutter, cut out 5 circles, you may not get the all out of the original sheet, so ball up the dough and roll it out again. Place the pie crust circles in a muffin tin and gently press down in, shaping the sides. Evenly distribute filling between the 5 crusts. If doing a top crust, whisk together egg and water to create egg wash and use a basting brush to brush over the top of the crust. Sprinkle with sugar and bake for 10-15 minutes until crust is golden brown, allow to cool in pan for 5-10 minutes. Gently remove from pan and serve warm with ice cream and whipped cream. Double the recipe, except for the egg wash for a large batch.